Hint: One of them is a steal. Occasionally, investors can find a decent dividend yield, a sustainable business, and an excellent entry point -- all in a single investment. But these opportunities don't come around very often. Do Walt Disney (NYSE:DIS), JPMorgan Chase (NYSE:JPM), or Apple (NASDAQ:AAPL) embody one of these rare opportunities after getting hit hard in the stock market during the past twelve months? All three stocks are down about 14% or more, with Apple falling the furthest, recording a 26% decline during this period. Commonly recognized as staple dividend names, a sell-off of these three enduring business may be presenting an excellent buying opportunity for investors looking for both a strong business and a stream of income. 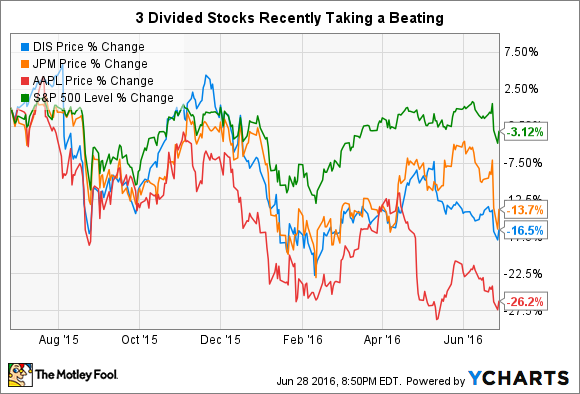 Of these three dividend stocks, Disney arguably sports the frothiest valuation. Don't mistake a sell-off for investor pessimism about Disney's future. Trading at a price-to-earnings ratio of nearly 18, investors are still pricing in double-digit annual EPS growth over the long haul. And this doesn't help dividend investors. Unsurprisingly, Disney's premium valuation means its dividend yield isn't very impressive. Investors who buy shares today will get a dividend yield of 1.5%. But investors who wait around for companies like Disney, along with their powerful, enduring brands, to trade at a "cheap" valuation may miss out. Consider that Disney has traded with a price-to-earnings ratio as high as recent as 25 just 11 months ago. Still, Disney stock just doesn't look quite like a bargain. Sure, with hot brands like ESPN, Marvel, Star Wars, Pixar, and an ever-growing cast of Disney characters, it would be tough to argue Disney merits a cheaper valuation than it has today -- even if it's facing headwinds as it transitions to a multi-screen environment. But a price-to-earnings ratio of nearly 18 already anticipates years of excellent execution from management, leaving investors without the big margin of safety that would qualify a stock as a bargain. Thanks to its robust dividend yield of 3.2%, JPMorgan may instantly stand out to some dividend investors as a solid opportunity. And a closer analysis of the stock's valuation fortunately confirms this notion. One of useful way to look at the valuation of a bank is by examining its price-to-book ratio. Currently, JPMorgan trades with a price-to-book ratio of 0.9. While this is above an industry average of 0.8, it's below the ratio of 1 JPMorgan has averaged during the past five years. Given JPMorgan's enormous scale as one of the world's largest banks, it can be argued that it deserves to trade at a higher premium to peers than it is. Scale is incredibly important in banking, and JPMorgan certainly possesses it. Indeed, JPMorgan's $2.4 trillion in assets even handily beats Wells Fargo's $1.8 trillion in assets. JPMorgan Chase stock may look like it could be a buy after a 14% sell-off in the past twelve months. But is it a bargain? Probably not. Apple stands out as the bargain of these three companies. With a dividend yield of 2.4%, Apple's dividend payout is solid. Sure, it may be smaller than JPMorgan's 3.2% dividend yield, but it's well over Disney's 1.5% yield. But where Apple really stands out is valuation. Thanks to market worries about the sustainability of Apple's iPhone business -- worries that are arguably overblown -- Apple's business is essentially priced to stagnate at current levels. This is particularly surprising considering Apple's revenue and EPS are up 7.2% and 11.1% in the trailing-12-month period, respectively, and analysts, on average, expect Apple's EPS to increase 9.2% annually over the next five years -- growth that would make Apple stock a downright bargain today. Trading with a price-to-earnings ratio of just 10.4 at the time of this writing, and after shedding about a quarter of its value in the past twelve months, Apple has the characteristics of a bargain dividend stock. Disney has the business, but misses on dividend yield and valuation. JPMorgan looks good on all fronts -- but not good enough to be considered a bargain. Apple, however, has the sustainability.